NOTE: Before beginning, ensure that ports 2181 (Zookeeper) and 9092 (Kafka) are open on the first server and port 9092 (Kafka) is open on the second server. Also ensure that remote connections are possible between the three servers (instructions). Restart the Kafka and Zookeeper services. Edit the /opt/bitnami/kafka/config/server.properties configuration file and update the broker.id parameter. 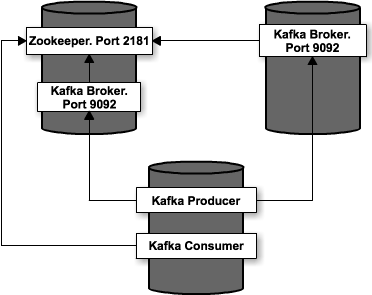 This broker id must be unique in the Kafka ecosystem. In the same file, update the zookeeper.connect parameter to reflect the public IP address of the first server. Edit the /opt/bitnami/kafka/config/consumer.properties file and update the zookeeper.connect parameter to reflect the public IP address of the first server. NOTE: The following commands should be executed on the third server (Kafka message producer/consumer). Produce some messages by running the command below and then entering some messages, each on a separate line. Enter Ctrl-D to end. Consume the messages. The consumer will connect to the cluster and retrieve and display the messages you entered in the previous step.